Out’n’About is a truly unique place. Part of it’s uniqueness has to do with that it is a home grown and based business. There are no locks on the treehouse doors. It is not a Ramada or Hilton in the trees, but is a genuine four star Treesort catering to both the timid and adventurous, locals and travelers. 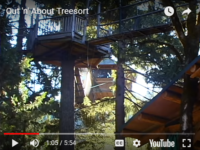 The Treehouses are only part of the 36 private acres of pasture and woods, right next to Siskiyou National Forest land & old growth wilderness close by. We have a Morgan Horse breeding ranch along with our riding horse stable, two rocking horses, 4 dogs, & 1 cat usually running around the property. Very family oriented and friendly you can find everything from a calm peaceful solitude, to a screaming ride on the ziplines or giant Tarzan Swing. Deep within the Siskiyou Mountains are dark, twisting passages that await your discovery. Eons of acidic water seeping into marble rock created and decorated the wondrous “Marble Halls of Oregon.” Join a tour, get a taste of what caving is all about, and explore a mountain from the inside and out. Either tour with the Daytime Discovery Tour, The Candlelight Cave Tours or the Off-Trail Caving Tour, or just plan a day trip to explore the Historic Chateau precariously perched on the mountain face. This National Monument and Preserve area is terrific for educational tours or just for a quick scenic get away. Nestled into the Siskiyou Mountains in beautiful Southern Oregon, and conveniently located along the historic Redwood Highway, Great Cats occupies 11 acres, with room for future expansion. A privately owned facility, the park is currently home to over 40 individual cats representing 17 different species and subspecies. Rusk Ranch Nature Center is a nonprofit organization in Cave Junction, Oregon with a mission to promote the wellbeing of the residents of the community and conserve nature. Monarch Butterflies are severely threatened with loss of habitat and the decline of wild milkweed that they must have to survive. At the center, the Cat Crew volunteers feed perhaps 50 caterpillars a day to raise butterflies for the Butterfly Pavilion. At the pavilion you can see chrysalids, caterpillars and emerging butterflies! Exhibits on Native Americans, mining, logging and pioneers. The historic Naucke House, built in the 1880s, is on the National Register of Historic Places. Admission: $10 for Family, $4 for Adults, $3 for Seniors (age 56+), $2 for Youth 6 – 16, Free for children 5 and under. School group $1/student & teacher/adult. 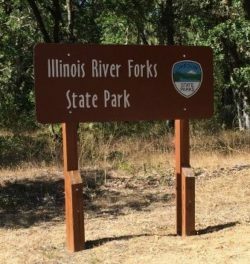 The East and West Forks of the Illinois River meet at the valley’s only riverside park, a grass covered day use area locally known as the “Forks Park.” There are picnic tables and pit toilet but no running, potable water. Things to do here include disc golfing, picnicking, swimming, and hiking. The park is wheelchair accessible, which includes access to a wheelchair friendly nature trail. The day use area is open during daylight hours – dawn to dusk. Dogs must be on leash.